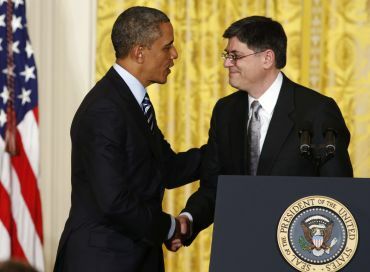 United States President Barack Obama, in an effort to rejuvenate the battered US economy, on Thursday nominated his chief-of-staff and budget specialist Jack Lew as the next treasury secretary. The 57-year-old, if confirmed by the Senate, will replace Timothy Geithner, who has announced his decision to quit the Obama cabinet by January end. "Jack Lew will bring an impressive record of service in both the public and private sectors for over three decades and economic expertise to this important role, and his deep knowledge of domestic and international economic issues will enable him to take on the challenges facing our economy at home and abroad on day one," a White House official said, explaining the reasons behind Lew's selection. "He also led the Office of Management and Budget under President Clinton and President Obama, negotiating a historic agreement with Congress during the Clinton administration to balance the federal budget and leading the negotiations of the bipartisan Budget Control Act in 2011, which brought discretionary spending to historically low levels," the White House official said. As Deputy Secretary of State for Management and Resources, in addition to managing the day-to-day operations of the Department, Lew managed the State Department's international economic policy portfolio and travelled the world to advance our nation's interest, said the official. "He also has a distinguished record leading private and public sector institutions and will bring strong relationships in the business community to his new role," the official said. "At Citi, he was part of the senior internal management team of this global financial institution, serving as Managing Director and COO of Citi Global Wealth Management and then as Managing Director and COO of Citi Alternative Investments," he said. A series of economic topics, including how to raise the $16.4 trillion federal borrowing limit to avert a first-ever default by the government and how to respond to China's growing economic might, would await Lew at the treasury department, experts said.